eBay is dead! Long live eBay! is the first thing that comes to mind when you talk about what’s happening to the online shopping portal. eBay was in India way before Flipkart and Amazon. Last year in August, the Flipkart-eBay merger was annoucned for 1.4 billion USD. As a part of the deal, eBay invested USD 500 million for an equity stake in Flipkart and handed over all operations of eBay India to Flipkart. 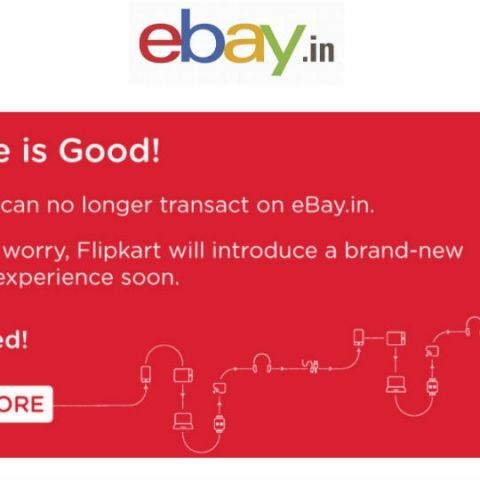 August 14, today, is when Flipkart will finally pull the plug on eBay India. Flipkart has said that it will not leave eBay users in the dark. Flipkart is launching a new platform that will deal in refurbished goods. This isn’t something new as we already have multiple websites like GreenDust, Togofogo, and even Amazon India, that deal in refurbished goods. eBay India will stop accepting new orders from today, August 14 2018. As of writing this story we can’t shop on eBay.in. If you are one with an eBay account, that account will not be carried forward to Flipkart. You will have to log onto Flipkart and create a new account. If you have recently purchased something from eBay.in, then worry not. All items bought on eBay.in are protected under eBay Guarantee. However, August 30, 2018 will be the last day for buyers to raise eBay Guarantee claims. If you have further queries about your purchases on eBay.in, you can check out the FAQ page here. When eBay was active in India, there were some horror stories about shopping on the platform. I for one never faced any problems. In fact, eBay global easy buy was my platform of choice when I wanted to buy products that aren’t officially available in India. I even purchased the Google Home from eBay in India a year before it was officially launched in the country. But there is light at the end of the tunnel. eBay has announced that it is planning on re-entering the Indian market. For this, it will set up operations from scratch with focus on “cross-border trade”. This will help the platform distinguish itself from other exiting ecommerce retailers in India.